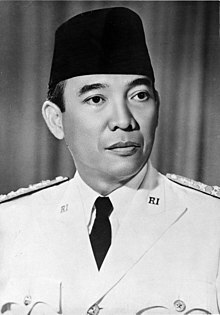 Sukarno, born Kusno Sosrodihardjo (6 Juin 1901 – 21 Juin 1970) wis the first Preses o Indonesie. Sukarno wis the leader o his kintra's struggle for unthirldom frae the Netherlands an wis Indonesie's first Preses frae 1945 tae 1967. He wis forced oot o pouer an replaced bi ane o his generals, Suharto, an remained unner hoose reest till his daith. Wikimedia Commons haes media relatit tae Sukarno.